Lightly toast bun halves or bread slices. Once cool, place in a sealable bag or wrap in foil. 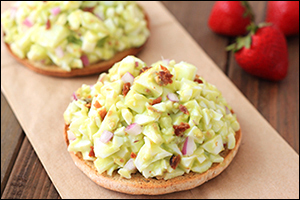 In a medium bowl, combine avocado, yogurt, and seasonings. Mix until smooth and uniform. Gently stir in chopped egg whites, bacon, and onion. Place in a sealable container, and pack with an ice pack. Just before eating, divide egg white salad between the toasted sandwich bun halves/bread slices, and enjoy open-faced. A perfect veggie 'n protein dish, with tons of flavor... This dish will cover four lunches, and each serving's huge! Meanwhile, bring a large skillet sprayed with nonstick spray to medium heat. Season chicken with salt and pepper. Cook for about 4 minutes per side, until cooked through. Use a fork to scrape out spaghetti squash strands. Place in a strainer to drain excess moisture. Thoroughly blot dry, removing as much moisture as possible. Let cool completely, about 20 minutes. Scoop 5 cups of cooked squash into a large bowl. (Reserve any extra squash for another time.) Chop chicken, and add to the bowl. Cover and refrigerate until chilled, at least 1 hour. Add remaining ingredients to the bowl. Mix thoroughly. Keep refrigerated, and pack your lunchtime serving with an ice pack. 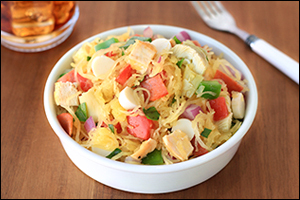 HG Alternatives: Click here for an easy slow-cooker method for cooking spaghetti squash. If you want to save some time, go the microwave-only route. Here's how... After nuking it to soften, cut squash into quarters. Remove seeds, and place one quarter in a wide microwave-safe bowl, cut side down. Add 2 tbsp. water, cover, and cook for 8 minutes, or until soft. Repeat. Hungry for More Healthy Lunches? Share these great options with your coworkers… so they'll stay away from your lunch! Click "Send to a Friend" now. Today, September 10th, is National Swap Ideas Day. We LOVE this -- head on over to the Hungry Girl Facebook page, and tell us about your favorite take-along lunches!